The 2014-15 membership shows 86,574 students, an increase of 563 students from the 2013-14 school year. Last year, Jeffco saw an increase of 469 students. With the new developments in the Northwest Corridor of Arvada (Candelas, Leyden Rock, and continued build out of 5 Parks and Whispering Creek), the district is expecting near 4,500 new students. Additionally, there is the Solterra development in west Lakewood with 400 homes in new construction and 600 more sites platted. The District has over $800 million in current facilities needs: buildings that are in the 30-50+ age group in need of new facilities, repairs or add-ons, and new buildings will be needed in the NW Corridor of Arvada and in West Lakewood, just to address the growth there. What happens to the overcrowding in other areas? If you missed the facilities presentation to the BoE at their Aug 23 Retreat, we invite you to click on the link below and check out some initial numbers and what school communities will be impacted by this growth. Additionally, we have provided for your ease of research a link to the updated facilities presentation from the September 18th Board Study Session, also below. 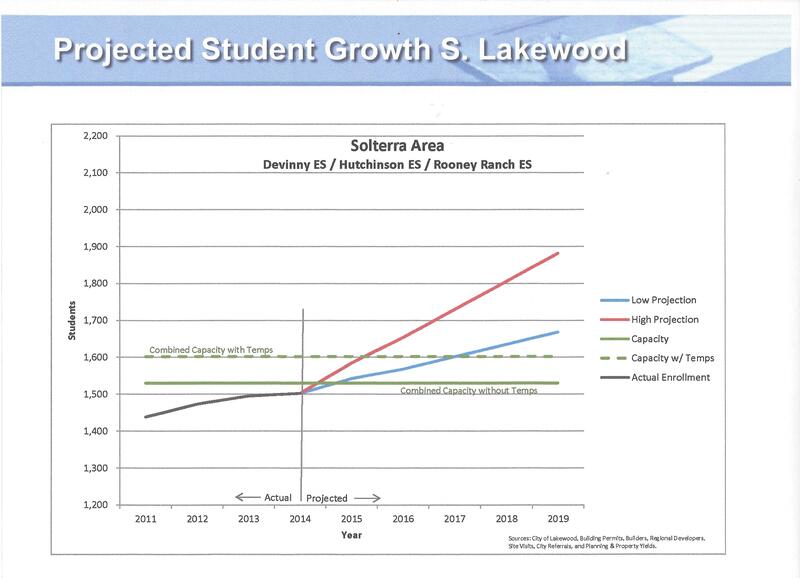 Solterra/West Lakewood Area either a new elementary school or add to Rooney Ranch ES. Growth places enrollment pressure on Rooney Ranch (99% utilization), Devinny (105%), Hutchinson (89%) and Kendallvue (105%) ES. Phase II of Sierra ES, first phase completed by 2004 Bond. Phase II was in the failed 2008 Bond. Work will complete the classrooms, library, and remove the existing building. Relieves enrollment pressure at Meiklejohn ES (95%), boundary modification will be required. Stein Elementary at 847 or 172% utilization; Dean Elementary 501 or 107% utilization. Devinney enrollment is at 553 or 110% utilization; Rooney Ranch enrollment is at 548 or 104% utilization. The Board of Ed has delayed this serious discussion; it is now scheduled for the meeting on December 11th. There is concern it will be postponed yet again. Decisions, thoughtful and strategic decisions, need to be made soon in order for the district staff to plan financial strategies and for families who will be impacted with upcoming kindergarten registration and choice enrollment. I have just spent a long night watching the streaming of the board meeting after having attended an interest night within the district. Early Friday morning I will attend another parent interest session outside of the district. My family is greatly impacted by the decisions, or lack thereof, regarding capacity issues in the district, particularly in the Ralston Valley and Standley Lake articulation areas. Where will sixth grade at our neighborhood school be located next year? In two years? In three years? If sixth grade moves to middle school, what other sixth grade options do families have who are unable or unwilling to attend the proposed neighborhood middle school? If sixth grade moves to middle school, what will sixth grade look like? Will they attend Outdoor Lab? Participate in a sixth grade play? Have a continuation ceremony? These events take a great deal of planning; without them, you rob these children of rights of passage. Where will the preschool be located next year and in the future? I do not believe that current or proposed charter schools are a viable solution to the tremendous capacity needs at the elementary, middle, and high school levels both in our area and throughout the district; what is this board doing to address the needs of our students, families, communities, and district, both in the short and long-term? At the board meeting on November 6, Mr. Witt implied that there is no need to make decisions until the board has more information, including about how Golden View Classical Academy (a charter approved on November 6) will help alleviate facilities issues. Mrs. Fellman pointed out that with current growth projections, 4,500 kids in north-west Arvada alone will need a school to attend. Even if GVCA exceeds enrollment projections and enrolls 500 students, that leaves 4,000 students who will attend the local schools that are already at capacity. I understand that Tim Reid, ED of Facilities is not available for the special session on November 20 so the issue will not be heard until the regular meeting on December 11. Even in the best case scenario, no decisions will be made until the meeting on January 15, 2015 (if then). This is halfway through the choice enrollment process, nevermind the December deadlines my family is facing for the out of district options we are considering. This means that I will not have any idea if my child will attend 6th grade next year at his elementary school or if he will be expected to attend middle school until at least January. For a board majority that touts “choice”, this greatly limit ours. We have absolutely no idea what his school programming will look like, who his teachers might be, whether he’ll have the true sixth grade experience he’s been eagerly anticipating and building up to since he started at our neighborhood school as a preschooler. We want him to attend sixth grade at his current elementary school, as anticipated, but we don’t know if that is in the board majority’s plans. Because of the capacity issues at our local schools, the options and choices we have for sixth grade are extremely limited. We moved back to Jeffco because we wanted a neighborhood elementary experience in an outstanding district. Now we are faced with uncertainty – an uncertainty has caused my family a tremendous amount of anxiety. I commend Mrs. Fellman for advocating for the community’s need to have decisions made so that our families may plan accordingly. Prolonging the decision until January forces my family and families in the community to plan for multiple scenarios: if sixth grade stays at our elementary school, what do middle school and high school look like for our family and, regrettably, how different those plans look if sixth grade moves to middle school. Why are we planning concurrently for these different scenarios? Because we believe in stability and this board majority is greatly limiting our ability to provide that for our family. We have taken time off of work to attend parent interest days both in and out of the district. Because of the lack of direction we are being given from the board, we are now faced with applying, perhaps futilely, for choice enrollment for sixth grade in schools that have their own capacity issues and concurrently applying to schools outside of the district and finally, much to my dismay, considering moving out of the district. We want our children to be able to attend sixth grade where they have anticipated attending sixth grade: in their neighborhood elementary school. I have been researching how detrimental it is to to move sixth grade to middle school and my family is extremely concerned. Without decisions from the board, our family, and other families in our community, are having to plan accordingly for scenarios we can not currently anticipate. It is time- and resource-consuming as well as anxiety-producing. Our families need decisions from this board both in the short- and long-term. I respectfully request that this board address the questions and concerns in this email directly to me. Please do not delay any longer the decisions this community and district need. As Mrs. Fellman said, this is about peoples’ lives. Again, we are wondering why no community conversations are occurring. Where do we give our input when we have children in these overcrowded schools? When will the opportunity for these conversations and accountability to community occur?